I picked up these Florabest 'self watering pots' from Lidl recently not sure what I was going to use them for but seemed a good price for a large pot! Although I think it is a bit of a misnomer to call them 'self watering' for as clever and all the design may be I pretty sure they don't walk themselves to the garden tap for a top up when feeling parched!! Having lost the polytunnel to it collapsing under one metre of snow earlier in the year I didn't get to put down any tomato plants. So I decided to put a couple of plants into these pots and hope that I'll have the new greenhouse up before the summer is out to ripen the fruit. 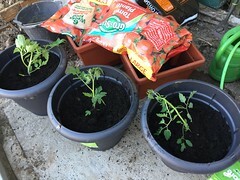 I had grown tomatoes in growbags before but always seemed to end up with them drying out, most success has been in deeper pots that are a bit more forgiving of an errant water boy. I divided the contents of an 'Extra Large' growbag (surely another misnomer!) 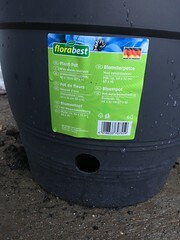 into the three pots, about 18 litres each then topped with 'Growise' compost to end up with about 25 litres per pot, which I think is a decent amount of compost per plant? The pot has a false bottom below which is a reservoir for about 2-3 litres water. The hole on the side allows you to top up with watering can, also acts as an overflow if you're watering from the top so that you can't overfill the pot. I'm curious to see how long this reserve will last in the peak growing weeks without top up. Does anybody know how much a tomato plant needs in high summer? Anyone any experience using these pots? Not for tomatoes, but I have got two similar pots with quite large conifers in them. The reservoir seems to work very well - they have never dried out.